Former New York City police chief Bernard Kerik has pleaded guilty to lying to the White House and has also said he will admit tax crimes. 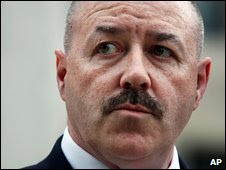 Mr Kerik, who was police commissioner at the time of the 9/11 attacks in 2001, was facing a corruption trial. He had his bail revoked two weeks ago for passing on secret pre-trial documents and has been in prison since. He was charged with lying to the White House in 2004 while being considered for a job as homeland security chief. Mr Kerik made the first of eight expected pleas at a court in White Plains, New York state, on Thursday. The admissions are part of a plea bargain designed to head off three pending trials on 15 federal counts. Mr Kerik had previously denied all charges. He is alleged to have accepted a $250,000 payback in the form of apartment renovations from a company to which he gave a city contract. He is also accused of failing to report more than $500,000 in taxable income between 1999 and 2004.